1. Thou shalt examine all of the Holy Tissues of Dentalism, forsaking none, with a critical eye and probe and without prejudice or favoritism, for that which is hidden will thereby be made plain. 2. Thou shalt give the gift of numbness whenever thou dost approach the Holy Tissues with damaging intentions, for the Holy Tissues are connected to a greater being who doth deserve tenderness and mercy. 3. Thou shalt not extract without radiographs lest thine eyes be struck from thy head. 4. Thou shalt not leave root tips, and if thou dost leave tips thou shalt have dire dreams during wake and sleep with visions of purulence and agony, and these dreams shall be with thee unto the end of the world. 5. Thou must makest flaps, and verily thou must close them without tension, for tension is the great enemy of healing. 6. Thou shalt use thine instruments for good and proper purposes and not abuse them by word or deed, that they might serve thee faithfully until thou growest old together. 7. Thou shalt use neither chisel, nor mallet, nor Dremel, nor screwdriver, nor saw, nor any other instrument of carpentry upon the Holy Tissues of Dentalism. 8. Thou shalt control thy pointed tips and dampen thy towering strength when driving instruments, for only thus are chaos and blindness averted. 9. Thou shalt palpate all swellings, and if clarity is not obtained thereby thou shalt radiograph, for radiographs shall make clear all that is unclear, and bring order to all thought. 10. Thou shalt not enter waters that threaten to submerge thy head even over thy brows, instead coming to awareness that thou hast help and succor in the dwellings of the High Practitioners of Dentalism and that thou art not alone. 1. Your veterinarian should do a thorough examination of the entire mouth whenever any dental problems are found. This means examining EVERYTHING, not just the crowns of the teeth. Your vet needs to look at the crowns, sure, but also needs to examine the back of the throat, the soft palate, the tongue, the tonsils, the area underneath the tongue, the insides of the cheeks, the salivary ducts, the lips, the hard palate, and the TMJ joint (jaw). If this is not done your veterinarian can miss important pathology, like lacerations in the mouth, tumors (some of which are treatable when caught early, but not if undiscovered until late), salivary gland inflammation, periodontal disease, dental infections, and a host of other issues. This WILL require a general anesthetic. Tartar is the least of our worries, and having someone scale it off does not constitute an adequate dental cleaning or assessment. In fact, it’s harmful to your pet because it will delay the definitive treatment of the problem. 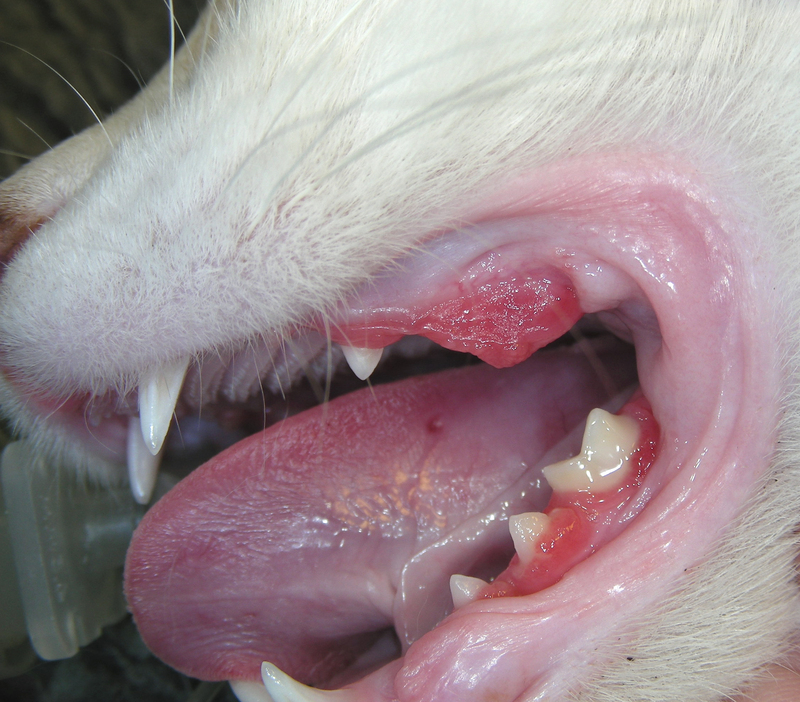 In my practice 83% of the pets who are presented for “dental cleaning” have significant periodontal disease. I have seen several patients with tartar-free mouths and persistent mouth odor who needed multiple teeth extracted. One dog I saw this week had been to a groomer to have the teeth “cleaned” 3 months ago and the owner was told everything was fine. I extracted 15 teeth due to advanced periodontal disease. It’s likely this was present for several years. It was certainly present when the “cleaning” was done, but was completely unrecognized. Why? Because groomers are not veterinarians or veterinary technicians and have no training in dental pathology. It’s like your hair dresser saying, “Oh, while you’re here, can I clean your teeth?” You’d think he’s crazy. But for some reason we think that it’s different with dogs. I don’t get it. 2. Your veterinarian should do a local anesthetic block before doing painful procedures like extractions, just like your own dentist does. It’s the humane thing to do. 3. Your veterinarian should have the capability to do dental x-rays. I can’t imagine a human dentist trying to practice without taking x-rays of problem teeth, but that’s what some veterinarians try to do. Before you schedule that dental procedure, make sure your vet can do dental x-rays. If not, find a different veterinarian to do the procedure. In my opinion dental radiographs are the standard of care. 4. Your vet should extract teeth very carefully and get the roots out intact. If root tips have been broken off, every effort should be made to retrieve them. When your vet extracts teeth they should always x-ray the mouth afterward to make sure that there are no root tips or other tooth bits left behind. 5. This just talks about closing the gums over extractions sites. 6. Vets should treat all of their instruments with care, keep them sharp if they need to be sharp, and use the instruments only for their intended purposes. 7. Vets should have proper dental instruments. These are not cheap. I have heard of vets taking financial shortcuts and cutting teeth with things that are definitely not meant to be in the mouth, and ofter are not sterile. Sad to say, this still happens in some places today, though I think the vast majority of vets take great care with dentistry and are dedicated to “doing things right”. Still, there’s one in every crowd. 8. Vets who do dental extractions understand this one. You can do a lot of damage in the mouth with extractors and luxators, so all force needs to be carefully controlled. 9. X-rays can tell you a LOT about swellings in the mouth. What looks like a mild thickening if soft tissues can turn out to be an invasive cancer. So take a x-ray. 10. Veterinarians can’t know everything about everything, and cannot have Michael Jordan skills in all areas of practice. If a veterinarian thinks that he will be in over his head (or gets in over his head) on a case, there are board-certified veterinary dentists available to consult and help, or to whom the case can be referred. Boarded dentists are our friends indeed. This entry was posted in Animals, Cats, Dogs, Veterinary and tagged Animals, Cats, commandments, dental disease, dentistry, Dogs, Humor, Veterinary by Claws. Bookmark the permalink.